The following article was originally published here on the ten year anniversary. Christopher Hitchens saw clearly the true nature of the threat and did not quibble about moral equivalence. He passed away shortly after the ten year anniversary but his original article then is linked below and is a must read. Each year this day brings one further removed from the ultimate moments of sadness. With it, a faint hope as the day approaches it will be further removed from memory, less memorable, distant with less feeling. When the day arrives, those hopes are dashed. The first anniversary was the worst. Midday in downtown Hoboken the air was carrying the vibrations of loss from across the river. It wasn't a feeling, it wasn't a passing thought - it was palpable. Everyone has a story that day. Like so many, I had worked in the shadow of the World Trade Center for four years leading in never thinking of the dangers that would arrive. People perished murdered at the hands of terrorists convinced of their religious rectitude. Their victims were people I had worked with, done business with, gone to school with and some among the 57 neighbors here in Hoboken murdered that day. In 1993, my first reaction working in Tribeca to the news of the buildings being bombed was denial. Eight years later, I saw the second airliner hit and instantly knew the reality: terrorism. The people responsible for the 1993 attack were said by those who knew better they would be back to finish the job. * They were right. This time the murders were multiplied many times over, the damage seemingly incalculable in rubble from where the the two monoliths once stood. Words are inadequate. More important, it's necessary to do so anyway if nothing more than to not allow the remembrance to become too distant. 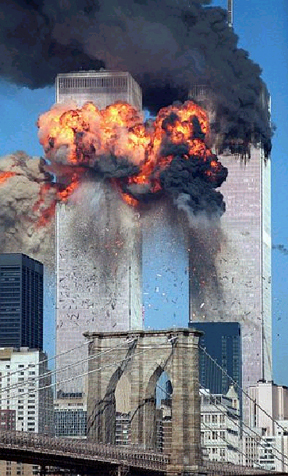 * One of the 1993 WTC bombers escaped to Iraq where he lived a comfortable life with a government home and check. His colleague Ramzi Yousef was captured and confident the job would be finished. Eight years later, Yousef's uncle, Khalid Shaikh Mohamed did. Related: Christopher Hitchens facing his own mortality reflects on the inherent nature of what America faced that day.